The future of Jetpack travel is a step closer after the latest record‐breaking test in the Martin Jetpack. At the end of May the Jetpack shot into the sky over the Canterbury Plains at a climb rate of 800ft per minute, reaching an altitude of 5,000ft (previous record 100ft/min & 50ft altitude) before safely deploying the first ballistic jetpack parachute. 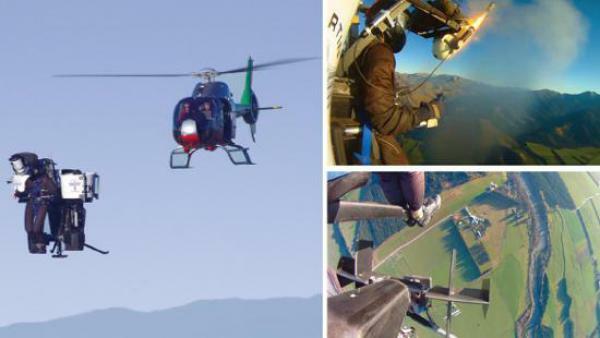 This incredible flight high above Pudding Hill in Canterbury, New Zealand is a major step towards commercial production of the world’s first practical Jetpack being developed by New Zealand’s Martin Aircraft Company. “This successful test brings the future another step closer,” said the Jetpack’s Inventor, Glenn Martin. The record‐breaking flight is part of an intensive period of flight‐testing for the Jetpack as the Martin Aircraft Company works through the final development phase of the Jetpack’s technologies with the aim to have first deliveries of both the manned and unmanned (UAV) versions to key customers within the next 18 months. Named one of Time Magazines’ top 50 inventions for 2010, the Martin Jetpack has the ability to fly for half an hour or more, climb more than 1000ft per minute and to cruise at 100 km/h. “In this test we limited the jetpack to 800 ft./min climb so the chase helicopters could keep up,” said Martin. Another first during the high flight was the world first test of the Jetpack’s Ballistic Parachute safety system. While this test was a verification of the safety system using an off the shelf version; Martin Aircraft believes that with the purpose built Ballistic Parachute they are developing, unlike helicopters, the Jetpack’s avoidance curve can be removed entirely – meaning that with the Martin safety systems there is no height where a catastrophic failure needs to lead to significant injury. For this high altitude flight the company tested the UAV unmanned version using a weighted dummy simulating a pilot’s weight to demonstrate the Jetpack’s ability to fly high. The earliest Martin Jetpack customers are expected to be in the military and emergency response sectors around the world. Unmanned Jetpacks could be used for delivery, observation and extraction in areas and situations too dangerous for people and other aircraft to get to.